Mix spices well in shaker jar. On a paper plate remove enough of the spice mixture to coat pieces of fish thoroughly. Preheat a skillet to high heat. 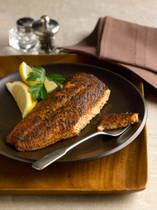 Add fish dry and cook quickly until spices are blackened and fish is cooked completely. Serve hot. Garnish with lemon and fresh parsley. Save the rest of the blackened spice mixture to use later. Works well with chicken also.